There is an an elevator that ascends 500ft. And takes you to the top of the monument to the observation deck. Tickets are limited per day and even though some might be distributed that same day in the morning, there is no guaranteed. If you have time to plan your travel then reserve tickets online to enter this iconic landmark. Between museums this is a perfect place to picnic, rent a bike, read a book, take a nap under a three. It is a busy area but not only for tourist. There are always events and locals come here often. Memorials and monuments are free and open 24/7. Some park areas have free Wi-Fi coverage. Recommend purchasing the Hop on and Off Bus if you don’t want to walk much. Must bring conformable walking shoes and a bottle of water. United States Capitol. The statue on top is called Statue of Freedom. Here is where the congress stands. It was completed in 1800 but the dome was added in the 1850’s. Its name was inspired by the roman Capitoline Hill. The british set fire to the building in 1814 and took several years to rebuild. They added other sections and now has 540 rooms. The Capitol Reflecting Pool completed in 1971. They were setting up for an event. The Washington Monument honors the first president of the United States, Made out of Marble, Granite, and Sandstone. 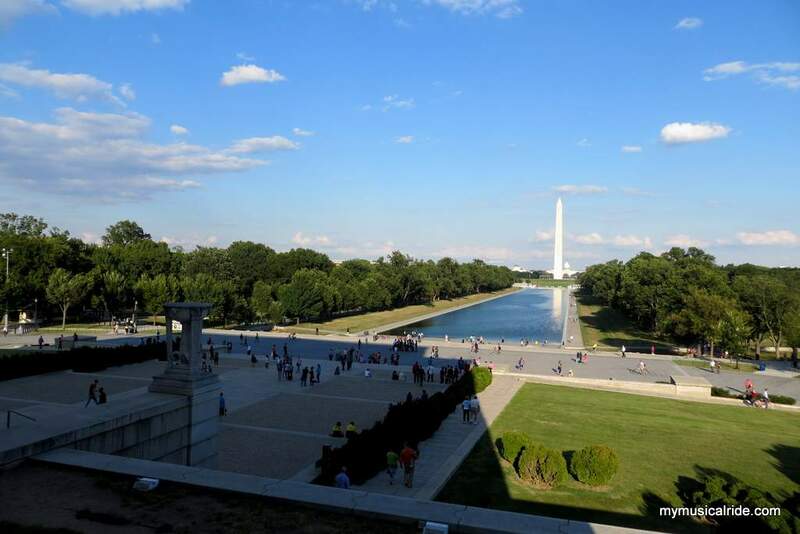 Perfect Views from the Top of the Washington Monument There is an an elevator that ascends 500ft. And takes you to the top of the monument to the observation deck. Tickets are limited per day and even though some might be distributed that same day in the morning, there is no guaranteed. If you have time to plan your travel then reserve tickets online to enter this iconic landmark. Tours inside the White House must be reserved with months of anticipation with your congress member or your country’s embassy in Washington. The White House. You might get a ittle closer than what I did. It looks smaller than on tv. The National Christmas Tree at the National Mall. In front of the White House. We can see greek influences. Building began in 1915. It was dedicated on May 30, 1922. Honor guest was his son, Robert Todd Lincoln. It is 19 feet tall and honors the 16th president of the United States. Just steps of the Memorial is where Martin Luther King, Jr., made his “I Have a Dream” speech in 1963. It was once the world’s tallest building with 555 feet tall. No building in Washington DC is allowed to be taller. Each column represents each state at the time of his death, 1865. The other 12 were later carved on the walls. This is simply a sad memorial dedicated to those brave men who served and fought for their country.